While Final Cut Pro X (FCP X) has generated a huge amount of buzz since its release, one of its companion apps, Compressor 4, has remained in the shadows. Compressor 4, unlike FCP X ( ) and companion app Motion ( ), offers users that warm, fuzzy feeling of a familiar interface and working methodology. Visually unchanged since 2007, this new version of Compressor does feature some significant updates under the hood. While it lacks the dark, smoky look of FCP X, and you now must purchase it separately, this app retains much of the legacy codec support that FCP X sorely lacks. One of the greatest benefits of Compressor 4 is the addition of HTTP Live encoding, which offers a full set of files encoded for the gamut of desktop and mobile devices—all in one folder and ready to upload to your server. Encoding the files at a variety of bit rates allows the video stream to be broken into smaller HTTP downloads, each representing a part of the stream that can be adapted by the receiving device based on bandwidth or other network capabilities. Compressor offers six pre-configured options—Broadband at 5Mbps and 2.5Mbps, Wi-Fi High/Low at 1.25Mbps and 750Kbps, and Cellular High/Low at 500Kbps and 220Kbps. This HTTP Live stream offers the added advantage of moving freely without being blocked as often by firewalls or proxy servers in the same manner as a typical download would be. Typical video streaming methods may fail to work when behind certain firewalls or proxy servers if sockets required by the stream are blocked. HTTP Live Streaming is immune to this problem because it uses port 80 over the HTTP protocol, just like a standard web page. Most of the updates to Compressor 4 are buried deep under the hood, but the most remarkable of them is the seamless integration with FCP X. This lets a majority of users access the power of multi-core or multi-machine compression and transcoding directly, without having to launch Compressor. Like FCP X and Motion 5, Compressor 4 offers accelerated 64-bit processing of codecs like ProRes and H.264, but maintains legacy support for older 32-bit codecs still in use. This version offers users both power and speed, while quietly residing in the background until needed. Complex rendering benefits from a 64-bit application, as more of the processing can be handled within the memory buffer at one time. Exporting directly from within FCP X uses 64-bit processing to handle rendering of complex video and audio, while the encoding is handled at 32-bit. Why did Apple do this? Because simply making Compressor a 64-bit application would not solve the problem of codecs that are optimized for 32-bit, or which are not multi-threaded. In fact, multi-threading and network rendering can save more time than just having Compressor at 64-bit. In not making Compressor 64-bit, Apple preserves the program’s compatibility with a wide range of current third-party 32-bit QuickTime codecs, thus making the transition to FCP X easier for some current users. For example, ProRes, as a multi-threaded codec, takes full advantage of all of this processing. By using all of the cores available—whether on one machine or across a networked render—it is not adversely affected by a 32-bit encoding process. Apple sees 32-bit encoding as a conduit for many of the professional workflows that are not yet supported in the new version of FCP X, and it allows users the ability to continue migrating between previously existing formats or file types to those which are more useable within FCP X. Most third-party plug-ins will require an update to work with the new processing engine, however it appears Apple has already begun to take steps to assure that updates from current developers will allow Compressor to operate seamlessly, including the ability to access hardware-based compression acceleration like the Matrox CompressHD, under both current and future OS development. Compressor 4's interface, unchanged from previous versions, is a welcome constant for users. It features tight integration with FCP X, with newly created setting options immediately available in FCP X. Existing format conversion capabilities, along with the ability to import Compressor 3 settings, will benefit anyone making the transition to this version. Do you really need Compressor 4? Apple says it markets Compressor as a separate app in order to fully enable its customization power rather than bury it within FCP X's Share menu. Under the new FCP X Share menu, common encoding workflows, as well as any custom settings created in Compressor 4, are now directly accessible from the timeline. Compressor 4 lets users create and customize compression settings and droplets, just like previous versions. This customization has the added benefit of allowing users to share settings between computers. Compression settings created in Compressor 3.x are directly transferable to Compressor 4 by dragging the older presets into the new version. Just navigate to the /Users/username/Library/Application Support/Compressor folder; copy the existing custom settings from Compressor 3.5; then drag those files into the Settings pane of Compressor 4 and all of your previous encoding settings are now immediately available for use in your new apps. While the HD DVD format is no longer supported as of this release, any of the other modified settings files are usable. You will need to set up separate encoding pipelines if you plan to use FCP X alongside the previous Final Cut Studio. If you are encoding clusters for Compressor 4 and FCP X, make sure that you have Compressor 4 loaded on each machine in the cluster. Be aware that, via the Mac App Store, Apple allows you to purchase an application once and install it on all your of personal computers. So you can install Compressor on multiple Macs and set them all up as personal encoding nodes with a single purchase of the app. Apple recommends that you stay with Compressor 3.5 clusters if you are going to continue working with Final Cut Studio, but to use Compressor 4 if you plan to work with FCP X and Motion 5. While seemingly unchanged on the outside, the core of Apple’s newest release of Compressor 4 (available for download only on the Mac App Store) reveals a robust workflow that’s completely integrated within Final Cut Pro X. As an upgrade in and of itself, it's somewhat better than average, though not stellar. That said, it facilitates direct access within FCP X to the power of Compressor’s rendering engine along with advanced customization capabilities that are fully accessible in both applications. 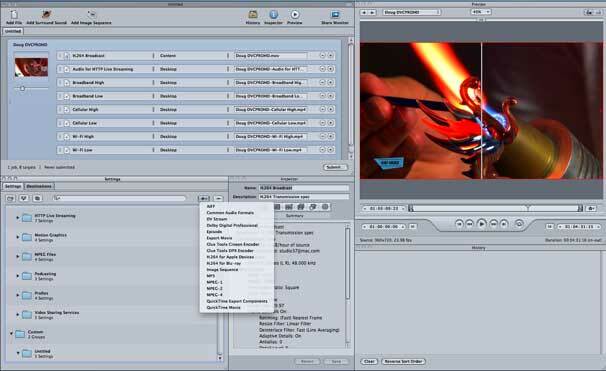 Compressor 4 is now marketed as a separate app requiring an additional cash layout to get the two things professional video editors need: advanced setting controls and multi-machine rendering. However, with that modest price, users have advanced power and a minimalist toolset at the same time, something Apple has always done exceedingly well. Now, can I get it with the darker unified interface that fits in so well with FCP X and Motion 5?